Designed by the infamous early nineties duo Ross Brawn and Rory Byrne, this car symbolised the arrival of the Benetton team to the top of the F1 pecking order, as despite it’s delayed start to the 1992 season, when it eventually arrived on the scene,it went on to score several podiums with it’s driver combination of a novice Michael Schumacher and more experienced head of Martin Brundle. The car wasn’t as technically adept as it’s rivals, being without such hi-tech aids as traction control or ABS, yet it was still competitive and reliable enough, with the powerful Ford V8 taking the car to a total of 11 podiums over the season. Brundle himself had his best ever season in F1 in this machine, scoring and impressive 5 podium finishes, including a fine 2nd place behind Ayrton Senna around Monza in Italy. that season he finished a lifetime best of 6th in the championship, with the Benetton Team taking a deserved 3rd on the constructors. 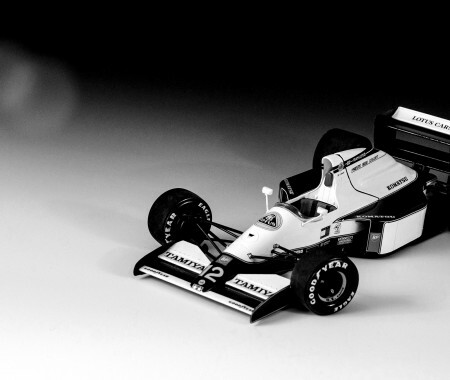 Yet despite such a successful season, Brundle was dropped from the Benetton F1 Team for the following season, as the successful B192 was developed into the championship winning B193. This Tamiya kit was a real pain, I’ll be honest, and has so far taken the longest to complete out of all the cars I have built so far. I did a fair bit of study for this car, taking in several examples online of other modellers builds, to see how they went about certain aspects of the car, such as detailing, or how they patched up the various parts that formed the monocoque. At first it appeared to be going quite well – on the kit, the cockpit has a floor that attaches from underneath, and this leaves an unsightly join across the body of the car if it isn’t filled and smoothed, so this was one area that I decided to make good. Fixing this join does mean that the seat and cockpit detail has to be assembled bit-by-bit with tweezers through the cockpit aperture, but that was the least of my worries. The colours of this car were the real problem, as for the life of me, I couldn’t get the the yellows consistent over different ares, such as the front spoiler, the cowl and the monocoque; if the paint was marked or uneven, sanding to respray only affected the colour further. In hindsight, I should have sprayed all block colours on the car – as unbeknownst to myself – on the kit decal sheet are a few alternative decals marked in red, for if you paint the background colours on to your model first. Typical. This would have made the finishing of the model much easier and provided far better finish. I did mange to make a good job of the wheels and tyres, and most of the photo-etch was applied without too much fuss, but there are many areas of the car with slight mistakes or areas that I simply got bored of trying to finish well. The rear wing was one of those – photo-etch end plates just would not glue to the trimmed kit parts, using either CA or epoxy resin, resulting in a rear wing that is slightly wonky. It was incredibly delicate, and painting, or apply decals resulted in breakages. I simply got fed up of continually trying to get those parts to stick together. The end result is far from perfect, and finishing this kit has been a real challenge…but such are the trials and tribulations of building scale model cars in your (fleeting) spare time!